Suzanne Cleary & Peter Harding of Up & Over It hand dance to Yolanda Be Cool‘s We No Speak Americano. What a treat to find Ira Glass and Chris Ware‘s Lost Buildings online so it can be shared. Support this kind of work by purchasing the Lost Buildings DVD and Book from NPR. 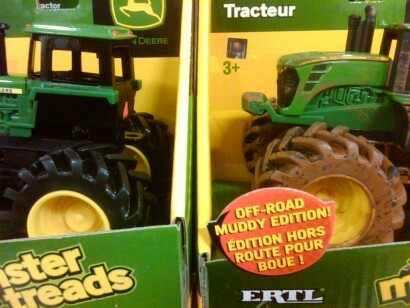 Who knew you could get a dirty toy tractor covered in brown paint? Just a Speck. We’re all just Specks. The population of the world has increased by roughly 3 Billion folks between when I was born in the mid-70s and now. Not quite double but relatively close. Certainly cause for pause. Reading the comments behind this week’s South Park censorship headlines when someone posted this video of author Philip Pullman fielding criticism on the title of his new book, The Good Man Jesus and the Scoundrel Christ. I recently discovered the song Home by Edward Sharpe and the Magnetic Zeros and can’t get enough of it. The energy and Jade’s voice are amazing. Check out their KCRW performance too. The video‘s a few months old but worth posting in honor of the iPad hitting the streets.